Can you imagine being out on the streets in these freezing temperatures? People that are homeless are in a 'catch 22', no money, no food, no roof over their head, no hope. Homeless people are treated like dirt, untouchables. Perhaps who knows some of them are angels in disguise, could you help an angel? These include loss of employment, divorce, long-term illness. Others include domestic violence, substance abuse, institutional discharge and many other factors that make it difficult, if not impossible, for people to pay rent or make mortgage payments. Homeless people do not choose to live on the street, they are forced to live on the street because there are no options for them. If they do not have an address they cannot receive money. If they do not have an address they cannot have a job. 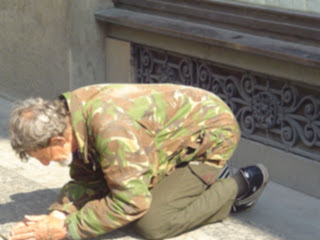 In these financial and economic crisis that are looming over us at the moment we may find that there will be others that will fall into the catergory of being homeless. Governments and councils should not spend the tax payers money on frivilous things. Homeless people do not choose to be on the streets subject to everyone's beliefs. Would you choose to sleep on the street in the conditions they do. Can you imagine your child sleeping rough or any of your family. We all have a choice to do the thing that feels good for the soul. I would love to hear from anyone that has any ideas of Solutions to solve any of the Worlds problems. Keep the comments going ... any ideas that you have seen please send me the links. HOW DO THEY DEAL WITH HOMELESS PEOPLE IN YOUR AREA?